This beautiful tour will make us discover all the magnificent Spanish Pyrenees of Catalonia in the Basque Country, revealing the unusual landscapes with a great trip in the Bardenas desert and grandiose in the wild sierras bordering all our tracks. You have do ride, absolutely! 6 days of tour / 5 nights half board from SOREDE to SAINT JEAN DE LUZ. Approximately 1150 km (70% off-road). DAY 1. Arrival in Sorède. We will meet in the village of Sorède near Argelés sur mer for the briefing in a charming hotel **. Dinner and overnight at the hotel. DAY 2. Sorède - Berga (220 km - 70% off-road) The beginning of our journey begins with a beautiful road the Massif des Albères, and we will finish crossing a small road leading to Petrus. 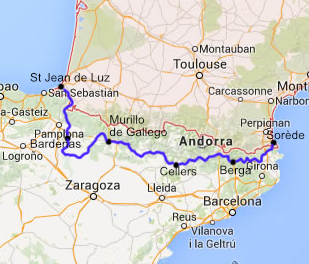 Then we will cross the mountains of Emporda and Alta Garotxa. Lunch in front of the amazing village of Catellfollit de la Roca. We use the road before we go down to Berga to close this beautiful day. Dinner and overnight at the hotel ** in Berga. DAY 3. Berga - Cellers (200 km - 70% off-road) Superb day where from the start, we will climb to 1800 m. to reach the pastures and discover the chain of the Pyrenees. We will discover the canyon of Aguasjuntes before arriving in Oliona where we will have lunch. We will then climb in the foothills Pyrenees and its beautiful clear slopes always offering fabulous views. Dinner and overnight at the hotel *** at the edge of Lake Terradets in the Pyrenees. DAY 4. Cellers - Murillo de Gallego (260 km - 70% off-road) Wonderful day of medium mountain with the peaks of the Pyrenees in the background. Pass by the lake of Caneles in the morning between sierras. Lunch to Barbastro. The beginning of the afternoon will be quite rolling before going up on the tracks of the mountains until Murillo de Gallego and its magnificent Riglos de los Mallos. Very nice hotel **** with pool and spa. DAY 6. 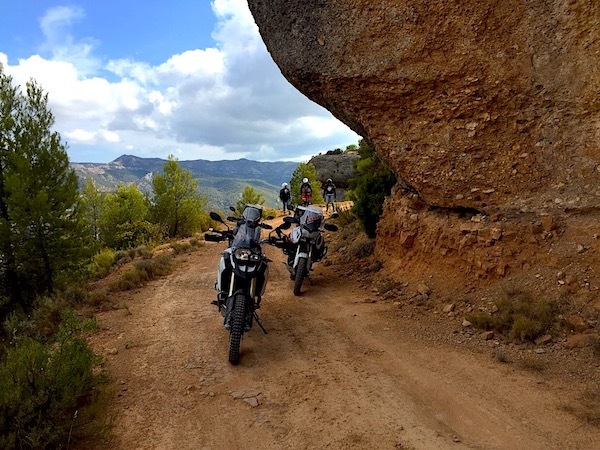 Sansoain - St Jean de Luz (210 km - 50% off-road) The mountains of the Basque Country Spanish menu for this last day. We will climb quickly in the dense forests north of Pamplona until we reach the beautiful summits reminiscent of golf courses where we will have the chance to admire Pottoks (wild horses). Lunch break in Urdax near the border. We will take the paths of the Basque Country to join the Atlantic coast to Hendaye to the beaches of St Jean de Luz, end point of our fabulous journey. - According to the choices of each one, you have the possibility of extending your stay in a hotel *** in St Jean de Luz.